Since our last newsletter of two weeks ago, I have been back to the panhandle area of Florida, to some of the areas hardest hit by Hurricane Michael’s landfall nearly four weeks ago. While I was impressed with the determination I saw in residents wanting to focus on getting back on their feet, I observed unmet needs and much confusion and frustration about “the system” of disaster recovery. Some survivors whose current housing is unacceptable, don’t have the financial ability on their own to afford rentals, and FEMA assistance in some cases just doesn’t cover the rental cost. 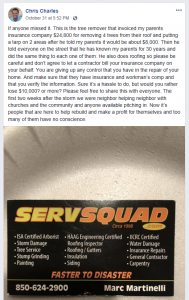 Others are getting denied by FEMA even though they have severe water damage. Mold is setting in. Residents are trying to navigate our state and federal disaster assistance system and the insurance process. There is confusion about who and how exactly FEMA helps. There is a perception that FEMA only helps uninsured homeowners, doesn’t help uninsured renters, and that how bad your damage is doesn’t determine how much money FEMA awards. Some commented that after an initial few days of national media attention, it seems the world has now forgotten about them. That’s not true, of course. There continues to be a tremendous outpouring of help and donations (more on that as well in this newsletter), including the Salvation Army, which continues to provide meals from its mobile feeding stations across the panhandle. On top of all of this, there is evidence of fraudsters and AOB abuse afoot. The Florida Department of Financial Services last week banned three contractors suspected of doing unlicensed work, pending a full investigation. And this Facebook post tells of potential AOB abuse (click on the picture at left). So housing, whether temporary trailers or RVs or whatever, is needed in the panhandle. FEMA at this point says those are options, pending a state decision. Stay tuned. In the meantime, the people of the panhandle who are salt of the earth type of folks, are trying to keep up their good spirits and get going again. As you read this newsletter, please consider how you can best help. Our last story in this edition offers suggestions on exactly how you can!